The 2015 SEMA Show in Las Vegas is fast-approaching and many companies are now in the midst of what is known as the "SEMA Crunch." 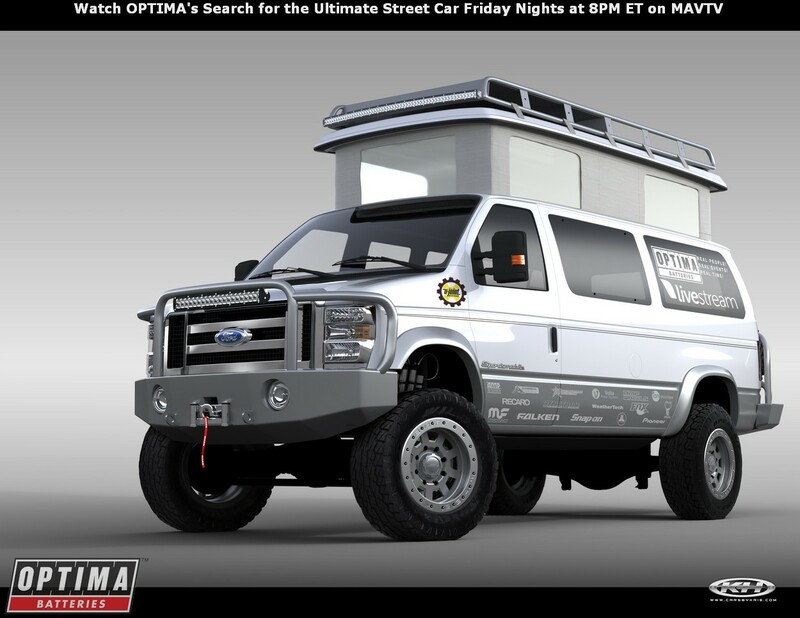 The OPTIMA crew is certainly not immune to this frenzy of activity, but much has happened with our 2014 Ford Econoline E-350 project van since our last update. The crew at U-joint Off Road can do a 4x4 van conversion in their sleep, so what might've seemed like one of the more daunting elements of the build went off without a hitch and the van headed west for a camper top and a full interior designed and build by MG Metalworks, LLC. The 2013 Super Duty full power truck mirror conversion is now complete and MG Metalworks will also custom-fabricate the mounting base and re-shape the plastics to fit the truck mirrors now on the van. When complete, the mirrors will have power fold, power telescoping, defrost and integrated park/turn lights...features many Ford Van owners wished were a factory option. There have been several test fitments of the flooring system and by the time you read this it will have gone through the final installation process. OPTIMA's own Cam Douglass took charge of properly-fitting the headliner back in the van after the camper top conversion was performed. Renderings of the side door cabinet are currently being turned into the real thing and are now at the powder coater for finishing. Final assembly of the custom cabinetry is also in process. With the flooring complete, the cabinetry is next on the list for final fitment, as well as the refrigerator and microwave mounting. Custom stainless steel countertops have recently been formed and installation will follow the cabinetry and appliances. Michael Gabriel from MG Metalworks tells us the build is progressing as planned and everything is falling into place nicely- a narrative not always describing SEMA builds this time of year.